Decision time; summer’s on the way, and your camping trips are on the calendar. A new tent would be a great treat, but of the several hundred tents you find on offer, which is the one for you? This primer might offer some helpful ideas on narrowing down your search for your new favorite summer home. 1) Price: Set yourself a ballpark figure, including your upper budget limits. Determine a price limit, and don’t go over that. You don’t need to – there’s a gazillion great tents out there, and you can ALWAYS find one that fits your budget. In setting a figure, consider how much you use your tent; do you camp every weekend during the summer, or once a year? Are you a ‘gear head, meaning will you likely be buying a newer, cooler, tent in a year or 2, or do you figure you’ll likely keep this tent for as long as you can? If so, maybe it’s worth considering a few extra bucks for that tent you’ll be living in. 2) How do you use the tent? Are you backpacking, hitting the trails and carrying this tent miles on end, or are you car camping a few yards from your ride? If you’re backpacking, you might consider the length of your trips; weekenders, or 2-3 week sojourns? When I’m heading out for a weekend, I typically have a better guess on what the weather might be like. I also like to go lighter and faster on those trips, so I want something that pops up fast and easy. Maybe a tarp will suffice, or a bivy sack. For longer expeditions, I typically prefer a more substantial tent, as I can expect that I might have to hole up in for a storm or 2. 3) Space: is it just you, or you and a partner, or you and the kids? Do you want a one person, a small 2 person tent, or something for your partner and the dog as well? Don’t make this decision based solely on the number of campers you have in your group. Use that number as a starting point, but definitely spend some time sitting in the appropriate tent in your local store, or rent a tent for an overnighter. You might find that 1 person tent in the catalog is, for you, a ½ person tent. Conversely, you might feel just peachy in the confines of a bivy sack. 4) Durability: This goes along with price, but oftentimes it works in a counter intuitive manner. I find that often the most expensive gear is the lightest weight gear – backpackers often pay a small fortune for a small weight saving. The lighter gear is, usually, not quite as durable and doesn’t hold up quite as well. Fabrics are thinner, stitching is finer and there’s less of it, poles are lighter, and so on. If you’re the type to replace your gear every year anyway, this might not matter so much. Or, if you’re the type who babies your gear and takes care of it, you might do better with the lighter weight gear. I know when I’m in the backcountry, and the weather is miserable, I’m cold and wet, all I want to do is just get my tent set up and jump inside, warm and dry. That being the case, a lot of the lighter weight gear doesn’t work so well for me; for you, it may work just fine. 5) Where do you camp? Do you camp in alpine and subalpine terrain? Designated campsites or off-trail sites? 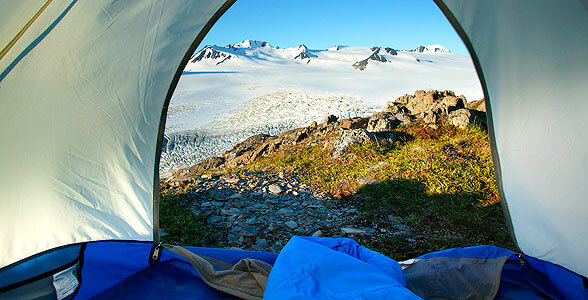 Often you’ll find you need a tent that has better wind resistance and is sturdier if you camp above tree line. Good solid guy points are more important as well for alpine camping. If you camp in the forest more often, this might not be as important. An ultra-light tarp tent might work great for some trips, but it might not be what you want for shelter in a mountain storm. Camping in the forest you might be comfortable with a hammock and a tarp. 6) Single-wall or double-wall: Is the weight saving of a single wall tent important to you? The trade-off will be breathability. I prefer a double-wall 3-season tent for my backpacking trips. I can roll up the door of the vestibule, or even remove the fly completely and still have protection from any mosquitoes. 7) Other issues to look at are the number of doors, size of the vestibule, ease of setup, etc. I’ve seen some folks buy an expensive 4 season mountaineering tent, thinking they were buying something ‘better’, because it cost more. But it took them, consistently, 30 minutes to set it up and 30 minutes to pack it up in the morning. Not a great system for a backpacking trip in the rain. I like 2 doors for myself, with 2 vestibules if I have a bunch of camera gear along on the trip. I store all my extra ‘stuff’ in one vestibule, and use the 2nd doorway for entering and exiting the tent. These preferences need to be yours, not mine. The style of camping I do might not match your own, and the priorities that I list highest might not match your own. If you do a lot of camping, I definitely recommend renting or borrowing a tent before you go out. It might not necessarily even be the exact model and brand you’re looking at, just one that is similar; the more you do it, the more completely you’ll develop your own understanding of what matters most for you. Lastly, don’t shy away from multiple tents for different uses. I take a small 1 person tent Mountain Hardwear PCT1 or a Big Agnes Seedhouse SL1 for some trips, but other trips I prefer the Mountain Hardwear Skyledge 2. A Sierra Designs Meteor Light is a great tent for basecamps and car camping trips where space and weight isn’t an issue. And then separate tents for the winter, camping in snow and snowstorms. When you hit the backcountry, your tent (or tarp) is your shelter. It’s not just your home, it’s your last shelter from the weather. It needs to hold up well, it needs to be comfortable, and you need to know how to set it up, pack it up, and get the most out of it. Choose wisely, and you’ll be a happy camper.